American journalist, political analyst, and lawyer Michelle Bernard will be the special guest at the Kiwanis Club of New Kingston’s 25th anniversary luncheon on June 18. Bernard, who is also president and CEO of the Bernard Center for Women, Politics & Public Policy, is scheduled to deliver an international perspective to the luncheon’s theme ‘Women’s Voices: Our Children Matter’. Based in Washington, DC, Bernard — who has Jamaican heritage — has had a distinguished career in domestic and foreign policy matters, particularly racial, social, and gender justice and the advancement of democracy, economic liberty, and the human rights of women, ethnic and religious minorities globally. Bernard was named in the November 2014 issue of Essence magazine as a ‘rising star’ on its annual Money & Power List. 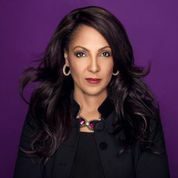 She is contributor to the Huffington Post, a regular political analyst on CNN and MSNBC, and serves on the executive board of the International Women’s Forum of Washington, DC, as well as the advisory board of the American Board for Certification of Teacher Excellence. Bernard is also an advocate for children with special needs. The Bernard Center for Women, Politics & Public Policy is a research and educational institution designed to change the terms of America’s most critical domestic and foreign policy debates and challenge the media to discuss those issues in order to improve the socio-economic status of women, ethnic and religious minorities; expand the effective participation of women, ethnic and religious minorities in the political and public policy arenas; and promote, advance and support individual rights, free markets, comprehensive education reform, personal responsibility, and smart government as the keys to achieving the American dream. Its scholars and analysts conduct high-quality, independent research and use the results to provide innovative, practical recommendations that advance these goals. The luncheon, which usually recognises pioneering women for their distinctive contributions or trailblazing efforts, is scheduled for midday at the Jamaica Pegasus hotel in New Kingston. This article originally appeared in the Jamaica Observer on June 7, 2015.